What Call of Duty: Black Ops 2 says about the future of war. How to use video games to imagine the future of war. A scene from Call of Duty: Black Ops 2. A version of this article first appeared on War on the Rocks. Recently, Call of Duty: Black Ops series director Dave Anthony was hired for an unpaid position as a senior fellow at the Atlantic Council. Anthony will help with the council’s work on the future of warfare. Anthony’s comments and his job description in the Atlantic Council press release suggest that he and the institution view his role as mining fiction to better inform reality. At first glance, given the futuristic games he has developed and the extensive consulting he has conducted with experts, the move seems like a no-brainer. 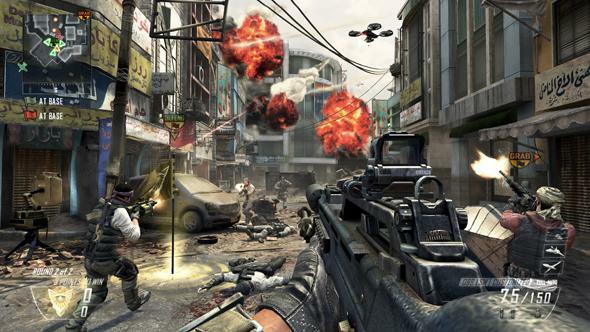 Black Ops 2 in particular is seen by leading defense futurists as a chilling vision of future warfare. There’s certainly solid precedent for it. In 1997, Marine Corps Gen. Charles C. Krulak called for better ways of improving military thinking and decision-making. The response was Marine Doom, a modified version of Doom geared toward preparing Marines for the battlefields of the future. The defense world has long called for better integration between the defense industry and the entertainment industry in simulation, modeling, and analysis of future scenarios. The Navy, with the aid of the Institute for the Future, recently stood up its own multiplayer game to crowdsource insights and ideas about future technology and tactics. Finally, institutions like USC’s Institute for Creative Technologies bring together the best minds in art and entertainment to help solve public policy problems. However, with great gaming power also comes great gaming responsibility. For decades, defense thinkers have pointed out that war games’ expressive power is both a blessing and a curse. In the right hands, a simulation or game can spur creative thinking and insight. But sometimes a war game merely reifies the assumptions of top generals and hinders our ability to comprehend adaptive adversaries. Somewhere along the way, Black Ops 2 became more than just a game. In Singer’s words it is an “inspiration” and a setter of “expectation[s].” Critics warn that this blurs the distinction between simulation and reality, but this criticism is wrongheaded. As cognitive science researcher Samuel Wintermute argues, our action and reasoning in the world is enabled by simulation—and this understanding of cognition may be key to building intelligent machines. Cognitive robotics specialist William Kennedy (who is a professor at George Mason University, where I am a Ph.D. student) argues that we simulate the actions of those we interact with through models of ourselves. Simulation is key to human existence, so Singer is not wrong to endow something like Black Ops 2 with significant power and potential. A more pertinent question, given the storytelling power and immersion of games, is how we know whether these expectations are the right ones. To be truly useful for defense futurism, games have to be something more than a reflection of the latest drone book or last week’s think tank briefing on latest new cyber-doom scenario. Unfortunately, in this respect Black Ops 2, which was released in 2012, represents a consensus future that is very much a product of a particular time and place. In 2012, the U.S. defense community was in a state of transition away from its preoccupation with counterinsurgency. This is reflected in the grab bag of thematic elements Black Ops 2 displays. A declining West and a rising East? Check. Cyber catastrophe? Check. Power diffusing to nonstate actors with an Occupy/Anonymous-like dynamic? Got that, too. Drones gone wild, and badass special operators that save the day? You get the idea. Black Ops 2 promised gamers a bold new vision of future warfare, and Dave Anthony—to his credit – sought out what was bold and new during the game’s development cycle. He picked the brains of a diverse array of defense and security analysts, and applied some entertainment industry magic to turn this intellectual soup into a compelling and highly lucrative game. The world that Black Ops 2 depicts is now indisputably on the policy agenda. China’s rise, mainly the interest of a few national security specialists who debated the so-called pivot to Asia, is now impossible to ignore. The Department of Defense stood up a command tasked to deal with cyber threats at least three years before the release of Black Ops 2. The Air Force has declared outright that it wants autonomous systems, and the Navy is fielding swarming boat drones. Finally, with the exception of tensions with great power rivals like Russia and China, America has spent more than a decade doing little except killing lots and lots of hostile nonstate actors. Granted, the manner in which we deal with these future concerns is open to debate. Defense technologists Michael Horowitz and Paul Scharre have both recently critiqued military robotics doctrines. But the mere fact that we are debating whether a “looming robotics gap” exists is an indisputable sign that once disruptive innovations are now an important part of the conversation. After all, few during the height of the counterinsurgency years fretted about a robotics gap. However sturdy this consensus looks today, truly disruptive thinking would hold that our current consensus future has a nontrivial chance of being completely wrong. It wouldn’t be the first time. Defense thinkers also ignore the myriad ways in which Black Ops 2 is, unsurprisingly, a typical video game. It deploys the tired cliché of the maniacal, omniscient, and all-powerful superterrorist who lays waste to Los Angeles with an army of mercs, terrorists, and drones. It would be fine if Black Ops 2 was just one of many competing visions of future conflict, and we critically examined it with the rigor that we would deploy on any other defense analysis. Instead, Black Ops 2’s value is seen almost solely through the prism of how much it reproduces the biases of the experts who helped create its fictional world. In other words, Black Ops 2 is good because it looks like a world that anyone sufficiently versed in post-Iraq defense debates can recognize. However, it seems a remarkable waste of the science fiction and gaming mediums solely to think of it that way, especially if we want it to help us think outside the box. Ultimately, Black Ops 2 is useful not as a means of diving the protean and ever-shifting future of warfare. It could be deployed as a way of critically examining the biases of the experts that Anthony surveyed in the development process. The game’s perfect rendering of the defense zeitgeist could set the stage for more creative thinking down the line. The franchise’s next installment could mess with those underlying assumptions and force policy analysts to take a step back and say, “Wait a minute, do I really believe that?” It’s hard to come to grips with your own biases—until your favorite game suddenly displays them to you. At the end of the day, if we want to have games help us think about the future—especially in matters of life and death—we need them to be more than just reflections of our own biases. Immersive and seductive fictional worlds can be dangerous if they are simply vehicles for reinforcing what we already believe. However, the seductiveness of games also reinforces the necessity of taking their policy potential seriously. So don’t just hire Anthony—bring the entire development team from Treyarch, which worked on Black Ops 2, on board. They have much to contribute. Anthony and his colleagues could very well use the powerful and compelling game they created to disrupt the security future they helped popularize. And in doing so, they wouldn’t just be revolutionizing the defense world and rendering a service to the nation. They’d also be demonstrating—if anyone wasn’t convinced by Black Ops 2’s blockbuster success—that games truly can make a difference.